Here it is, Christmas Eve, my bread is rising by the hearth, Attila is preparing to bake his chocolate chip cookies and croutons. And the oven on the stove has suddenly and irrevocably stopped working. Attila has pulled it out from the wall and fiddled with all fiddleable parts. No joy. It isn’t going to be baking our Christmas goodies this year or any other I suppose. We need a new stove and oven. Attila and I bought a Nesco free standing oven to use in our summer kitchen. When we bought the little house in the city, it served as our only oven during those first months as we began repairing the house. What a fortunate purchase, that Nesco! I am preheating the Nesco now, to bake my bread. Attila will bake his cookies and croutons in it later today. Tomorrow we will roast our turkey in the Nesco. Quite a little adventure on a Christmas Eve day! Wishing everyone a very wonderful Christmas/Holiday Season! This year, for the first time, in our time together, Attila and I are able to pay all our bills at Christmas. No shuffling, no borrowing from Peter to pay Paul, just simple direct payment of the money owed. This feels better than any wrapped present ever could! “How beautifully leaves grow old. How full of light and color are their last days. My thoughts are with those who are not as fortunate this Christmas, I have several dear cousins who are struggling with cancer and long wait times over the holiday season. I hope they have a truly wonderful new year! Family, people who know you from the time you arrive on the planet, until the time you leave; if your lucky. I feel lucky! This Christmas I received a very special teacup and saucer from my Mom. They belonged to my Grandmother. Just touching them gives me a warm and fuzzy feeling. 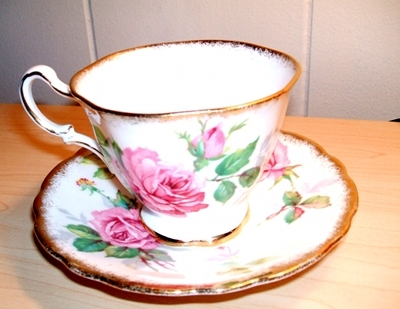 I think about showing the set to my grandbabies, this teacup and saucer that belonged to their Great Great Grandmother. My loved ones, looking back, stretching in time from 1902 when my Grandmother was born, until who knows when. How cool is that!